Storm-petrels are small aerial seabirds found in all oceans of the world. Near where I live on Monterey Bay, California, flocks of Ashy and Black Storm-Petrels (above, and perhaps one Least in upper left) often gather each autumn on the Bay. Farther offshore, the Fork-tailed Storm-Petrel occurs and may be driven into the Monterey harbor by storms (left). Recently storm-petrels have been split into two families, as genetic evidence reveals that ancestors of northern and (mostly) southern species diverged about 30 million years ago (Jarvis et al. 2014, Prum et al. 2016). Some research suggested that two groups may not even be each other's nearest relatives (Penhallurick & Wink 2004, Hackett et al. 2008). It is now best to consider them two families: Austral Storm-Petrels [Oceanitidae] and Northern Storm-Petrels [Hydrobatidae; this family]. 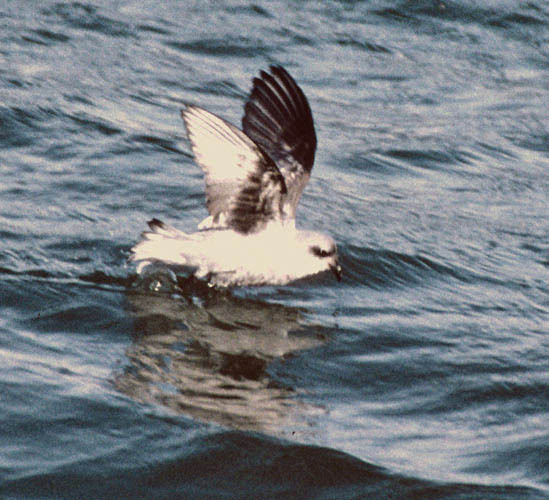 Some say the name "petrel" comes from a French version of St. Peter who, in biblical traditions, walked on the water. The "storm" part of their name refers to the fact they are only found on land during very strong storms. Indeed, the thin legs of storm-petrels cannot sustain their weight for more than a few steps — they avoid land except to come ashore, usually at night, to breed in burrows, caves, or crevices. Storm-petrels, like other members of the order Procellariiformes, have specially modified "tubes" atop their bills. This special organ, which you can see in this in-hand photo of a Leach's Storm-Petrel (right). This allows them to drink salt water and then dispose of the salt. One can sometimes see drops of concentrated sale being "sneezed" out of these tubes. Some storm-petrels are highly migratory, spending the summer month in rich cold waters far north or far south, and then moving toward the subtropics in the winter months. One of these is the lovely Fork-tailed Storm-Petrel (left) which breeds on tiny islets from Japan and Alaska south to northern California, and then disperses widely over deep oceanic waters in the non-breeding season. Where I live on Monterey Bay, California, this species is almost always far offshore. Occasionally, strong NW gales in spring or fall will force hundreds into Monterey Bay itself, and for a few days thereafter birds can sometimes be seen from shore. I took this photo from Monterey's commercial wharf during one such incursion. The Fork-tails blown inshore try to get back offshore as soon as possible. Local Western Gulls find them to be easy prey, and storm-petrels inshore don't last long. An impressive concentration of storm-petrels occurs in Monterey Bay, California, annually. Each fall nearly the entire world's population of Ashy Storm-Petrels gather in day roosts over the north rim of a huge underwater canyon in Monterey Bay. Depending on oceanic conditions, these will be joined by hundreds to thousands of Black Storm-Petrels from the south, and the occasional Least or Wilson's or Fork-tailed Storm-Petrel (vagrant Wedge-rumpeds have even occurred). The montage below combines photos from 3 photographs (Les Chibana, Jeff Poklen) in 2004 to show a bit of the experience. The upper tier show the flock, mostly Ashy, on the water or just taking off. In Jeff Poklen's middle left shot, one can compare a few larger Black Storm-Petrels among the Ashy Storm-Petrels and there is a mystery bird near the center that could be a Least. Les Chibana's shot of a definite Least Storm-Petrel is middle right (and much enlarged compared the rest). About half of the storm-petrel species are tropical or subtropical, staying within warm waters but wandering widely as food can be patchy and hard to find. A set of storm-petrels of deep offshore warm waters is currently delimited under the name Band-rumped Storm-Petrel (right). Its basic pattern — black bird with a white rump band — is a feature shared with 8 other species. The bands vary is size and extent, but identification of these birds can be difficult. Flight styles and behaviors are important; see Crossin (1974), Boswell (1979), Brown (1980), Marsh (1980), Naveen (1981-1982), and Harrison (1983a) for starting points. Recent genetic and breeding phenology evidence suggests that there may be four (or more?) distinctive populations of Band-rumped Storm-Petrel in the tropical Atlantic Ocean (Bolton et al. 2008, summarized in Robb et al. 2008, Bennett 2009). Further, populations in the Pacific are even more distinctive (Friesen et al. 2007, Bolton 2007). 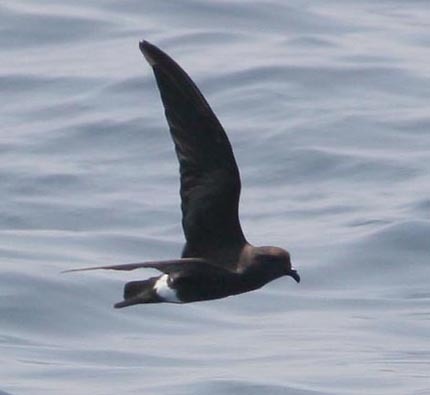 It is possible that birds currently lumped as "Band-rumped Storm-Petrel" Oceanodroma castro should be assigned to somewhere between two (Atlantic vs. Pacific) to six or more species (four in Atlantic, two more in Pacific). In the Atlantic there are summer breeding birds on the Canary Is., Madeiran Is., and Selvagens (nominate castro) and summer breeders in the Azores (already proposed as O. monteiroi Monteiro's Storm-petrel; Bolton et al. 2008), and then there are winter breeding populations on the Azores, Canaries, and Madeiran islands (not yet formally named but informally proposed as "Grant's Storm-Petrel" in Robb et al. 2008; the photo above right is presumed to be from this population), and a year-round breeder on the Cape Verde Is. (jabejabe; can breed much of year but most nest in winter; Robb et al. 2008). In addition, there is now evidence of summer and winter breeding populations on St. Helena I. in the south Atlantic (Bennett et al. 2009); there are also summer and winter breeders in the Galapagos (Friesen et al. 2007). Band-rumped is not the only storm-petrel to have summer and winter breeding populations on the same island. 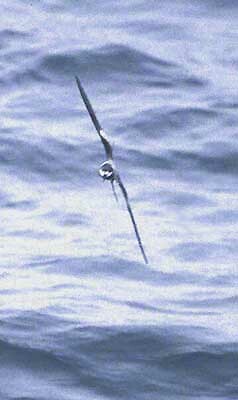 This phenomena also occurs in populations of Leach's Storm-Petrel on Guadalupe I. off western Mexico; Ainley (1980, 1983). Recent evidence suggests that there may be four species of storm-petrel to be derived from the Pacific Ocean populations of Leach's Storm-Petrel (see Howell 2012). Storm-Petrels have incredible powers of smell and therefore can locate potential items to scavenge from miles away. One Band-rumped in the eastern tropical Pacific followed in our ship's wake for an hour, quite possibly attracted to odors emanated from the kitchen for the large research ship, or oily wastes dumped overboard. On this same research cruise we came upon a large dead baleen whale in tropical waters about 400 miles SW of the tip of Baja California. 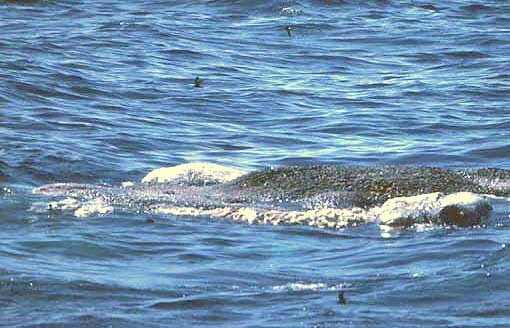 The carcass of this dead whale was surrounded by hundreds of Wedge-rumped Storm-Petrel (left). By the time we got close, many of the birds had flown but there are at least four in this shot. Yet another experience on my four months at sea in fall 1989 was observing one of the world's rarest and least known storm-petrels, the Ringed (or Hornby's) Storm-Petrel (left & right). It forages solitarily over deep water far offshore western South America (Ecuador to Chile) but its breeding grounds, possibly somewhere on the mainland in remote dry deserts, have yet to be found; Carboneras (1992). Storm-Petrels breed on remote islands, islets, or on certain desert mountains in South America free of land predators. Most come ashore to breeding sites after dark to avoid predation by gulls or other large seabirds. On the Farallon Islands off San Francisco, California, for example, where I have spent a couple weeks helping research efforts, the air is alive with the sounds of returning Ashy and Leach's Storm-Petrels after dark in the summer. Over 90% of the world's Ashy Storm-Petrels nest on the Farallones. You can now enjoy the cacophony of sounds made by some Atlantic storm-petrels on the CDs that come with Robb et al. (2008). Photos: The top photo of a flock of Ashy & Black Storm-Petrels Oceanodroma homochroa & O. melania, and probably a Least Storm-Petrel Halocyptena microsoma, was taken on Monterey Bay, California, on 30 Sep 200g. The Fork-tailed Storm-Petrel Oceanodroma furcata was photographed from Monterey's commercial wharf on 18 Apr 1995. 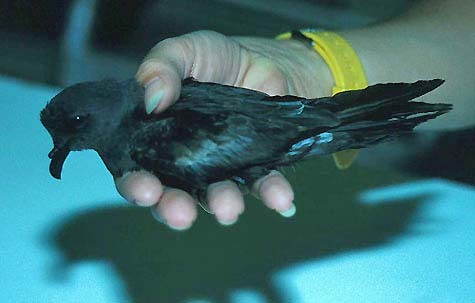 The Leach's Storm-Petrel Oceanodroma leucorhoa came aboard the research vessel McArthur at 2°17'N, 116°59'W, on 30 Nov 1989. The montage of flocks of Ashy & Black Storm-Petrels were on Monterey Bay, California, on 19 Sep 2004 (top tier of montage © Les Chibana, middle left tier © Jeff Poklen) while the isolated Least Storm-Petrel Halocyptena microsoma was photographed there by Les Chibana on 5 Sep 2004. 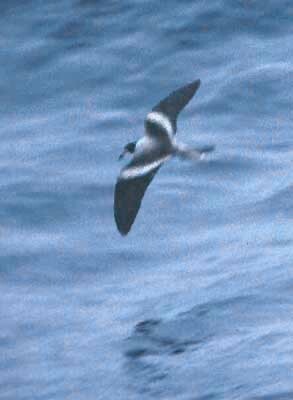 The Band-rumped Storm-Petrel O. castro was at about 19°N, 115°W, on 2 Aug 1979. The scavenging Wedge-rumped Storm-Petrels O. tethys were surrounding the whale carcass at 21°04'N, 87°53'W, on 1 Aug 1989; our best guess at the whale species involved was a Fin or a Bryde's Whale. The Ringed Storm-Petrel O. hornbyi was west of northern Peru at 3°S, 82°W, on 29 Sep 1989. All photos © Don Roberson, except those attributed to © Les Chibana and © Jeff Poklen, and used with permission; all rights reserved. There are many seabird books, but apparently none which can strictly be called a family book on the Storm-Petrels (there are monographs on individual species, however). A very fine introduction to the family, with a selection of nice photos, is in Carboneras (1992). Photographs of all species are in Harrison (1987), and art and text in his earlier work (Harrison 1983b). The photographs are quite nice, but one must be careful with the text (esp. of the earlier book) which contains numerous errors. There is also still much to glean from Murphy (1936). A new book that includes storm-petrels among Atlantic procelarids is Robb et al. (2008); it includes not only a lively text and lovely photos, but CDs with extended samples of storm-petrel calls at night. Ainley, D.G. 1980. Geographic variation in Leach's Storm-Petrel. Auk 97: 837-853. Ainley, D.G. 1983. Further notes on variation in Leach's Storm-Petrel. Auk 100: 230-233. Bennett, E., Bolton, M. & Hilton, G. 2009. Temporal segregation of breeding by storm petrels Oceanodroma castro (sensu lato) on St Helena, South Atlantic. B.B.O.C. 129: 92-97. Bolton, M. 2007. Playback experiments indicate absence of vocal recognition among temporally and geographically separated populations of Madeiran Storm-petrel Oceanodroma castro. Ibis 149: 255-263. Bolton, M. Smith, A.L., Gomez-Diaz, E., Friesen, V.L., Medeiros, R., Bried, J., Roscales, J.L., and Furness, R.W. 2008. Monteiro's Storm-petrel Oceanodroma monteiroi: a new species for the Azores. Ibis 150: 717-727. Boswell, J. 1979. Flight characters of Wilson's Petrel. Brit. Birds 72: 330-334, 386. Brown, R. G. B. 1980. Flight characteristics of Madeiran Petrel. Brit. Birds 73: 263-264. Carboneras, C. 1992. Family Hydrobatidae (Storm-Petrels) in del Hoyo, J., Elliott, A., & Sargatal, J., eds. Handbook of the Birds of the World. Vol. 1. Lynx Edicions, Barcelona. Crossin, R. S. 1974. The storm petrels (Hydrobatidae), in Pelagic studies of seabirds in the central and eastern Pacific Ocean (W. B. King, ed. ), pp.154-205. Smithsonian Contr. Zool. 158. Friesen, V.L., Smith, A.L., Gomez-Diaz, E., Bolton, M., Furness, R.W., Gonazalez-Solfs, J., and Monteiro, L.R. 2007. Sympatric speciation by allochrony in a seabird. Proc. Nat'l. Acad. Sci. USA 104: 18589-18594. Hackett, S. J. R.T. Kimball, S. Reddy, R.C.K. Bowie, E. L. Braun, M. J. Braun, J.L. Chojnowski, W. A. Cox, K.-L. Han, J. Harshman, C.J. Huddleston, B.D. Marks, K.J. Miglia, W.S. Moore, F.H. Sheldon, D.W. Steadman, C. C. Witt, and T. Yuri. 2008. A phylogenomic study of birds reveals their evolutionary history. Science 320: 1763–1768. Harrison, P. 1983a. Identification of white-rumped North Atlantic petrels. Brit. Birds 76: 161-174. Harrison, P. 1983b. Seabirds: An Identification Guide. Houghton Mifflin, Boston. Howell, S.N.G. 2012. Petrels, Albatrosses & Storm-Petrels of North America. Princeton Univ. Press, Princeton, N.J.
Jarvis, E.D., S. Mirarab, A.A. Aberer, B. Li, P. Houde, et al. 2014. Whole-genome analyses resolve early branches in the tree of life of modern birds. Science 346: 1320–1331. Marsh, P. 1980. 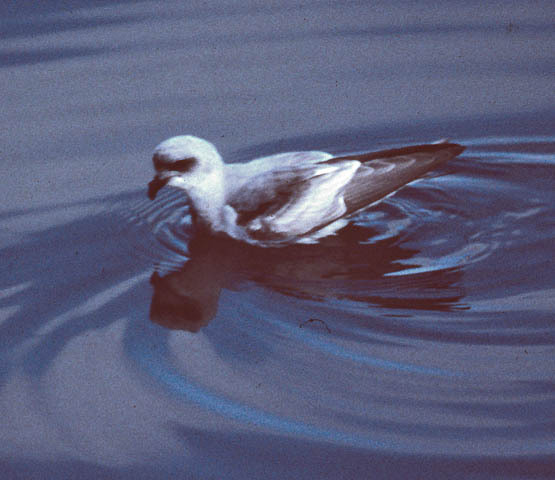 Identification problem produced by Leach's Petrel in moult. Brit. Birds 73: 474. Murphy, R. C. 1936. Oceanic Birds of South America. 2 vols. Amer. Mus. Nat. Hist., New York. Naveen, R. 1981-1982. Storm-petrels of the world: an introductory guide to their identification. Birding 13: 216-239; 14: 10-15, 56-62, 140-147. Penhallurick, J. and M. Wink. 2004. Analysis of the taxonomy and nomenclature of the Procellariiformes based on complete nucleotide sequences of the mitochondrial cytochrome b gene. Emu 104: 125-147. Robb, M., Mullarney, K., and Sound Approach. 2008. Petrels Night and Day: A Sound Approach Guide. The Sound Approach: Dorset, UK.